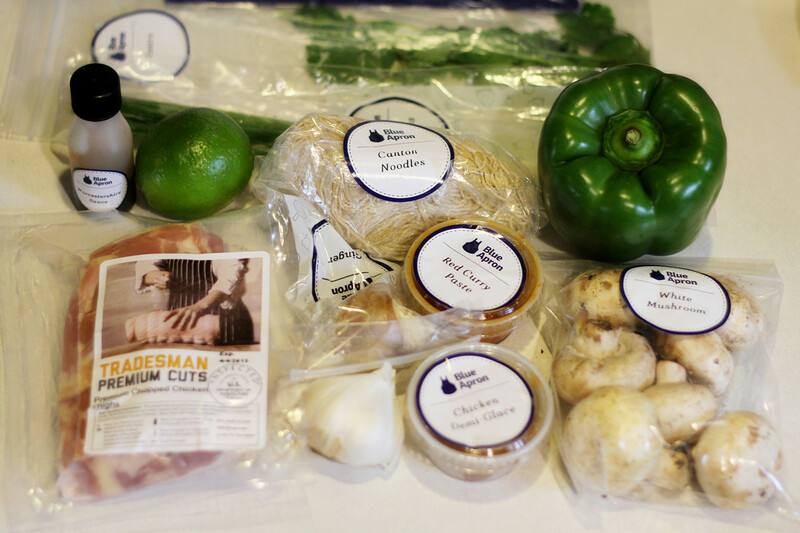 I've been curious about services like Blue Apron for a while. If the name doesn't sound familiar, it's a meal service that ships to customers on a weekly basis. But it's not prepared meals. 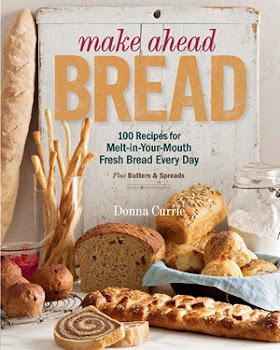 It's all of the fresh ingredients that you need to make the recipes they give you. A friend of mine described it as something like restaurant take-out, but without getting soggy from sitting in Styrofoam. In other words, really good food, served fresh. Since ingredients are pre-measured, it's easier than cooking from a cookbook. And there's no need for shopping. The only things you need to supply are salt, pepper, water, and oil. Every other thing was included, from a pat of butter to a small amount of heavy cream, to a handful of olives. Just like cooking from a cookbook, you need to do some work, and you do need some basic cooking equipment. This isn't dump-and-stir. If there are vegetables to be peeled and chopped, you will peel and chop them. If there's cheese to be grated, you will be grating it. I ordered a the two-person box, which included three meals (at no cost to me, for reviewing). When ordering, I was asked some basic questions about food preferences. Vegetarian? Fish? I selected the omnivore option, and received one seafood meal, one chicken meal, and one beef meal. It came in an insulated box with cooling packs, with the really small ingredients in bags to keep them contained. The instructions suggested that since fish is most perishable, that should be cooked first, so I tackled the Roasted Salmon, Fennel & Castelvetrano Olives with Cara Cara Oranges, Farro , and Salsa Verde. It sounds complicated, but the instructions were pretty simple and there were photos for the steps to make it a little easier. The other two meals we got were Spicy Thai Chicken Noodle Soup with Red Curry and Mushrooms, and Short Rib Burgers on Pretzel Buns with Hoppy Cheddar Sauce and Roasted Sweet Potato Rounds. The recipe cards are printed on a glossy stock, so if you splash something on them, you can wipe them off. They're not indestructible, but you can have one sitting on the counter, right next to where you're cooking. My husband and I were really happy with the results of all the meals, and there was plenty of food. The salmon was a reasonable portion, and the vegetables and farro made the salmon meal pretty substantial. The soup was really filling, and we ended up with sufficient leftovers for a few lunches. We also had some leftovers from the burger dinner. Hungrier folks might have finished it all, but I don't think anyone would consider the portions skimpy. Here's the salmon recipe, which is also available on the Blue Apron site. The recipes that you see online are formatted just like the recipe cards, complete with photos. Since their recipes seldom repeat, this gives you a chance to try recipes you missed, and you can recreate the ones that you did get, if you happen to lose the recipe cards..
Salmon, ready to roast, on a bed of onions, fennel and olives. Preheat the oven to 450°F. Wash and dry the fresh produce. Heat a medium pot of salted water to boiling on high. Remove the salmon from the refrigerator to bring to room temperature. Pick off and reserve some of the fennel fronds; thinly slice the fennel stems and bulb. Using a peeler, remove the rind of the orange, avoiding the pith; mince to get 2 teaspoons of zest (or use a zester). Cut off and discard the remaining orange rind and pith; medium dice the orange. 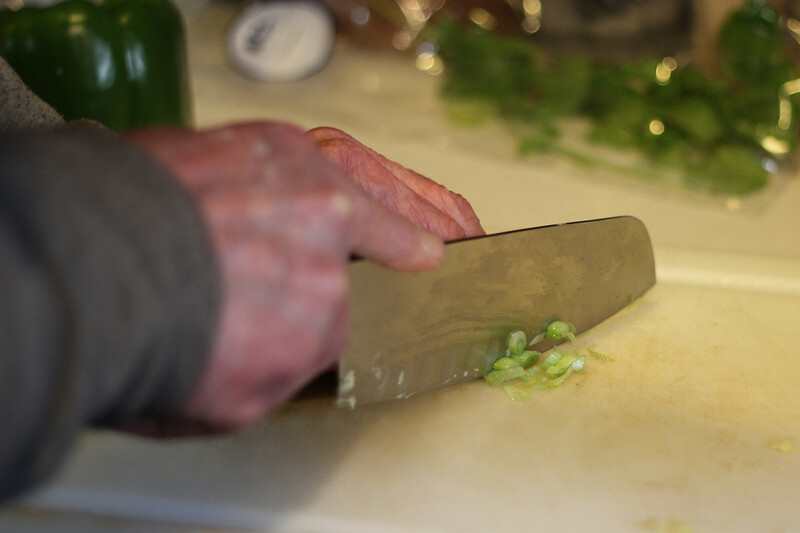 Peel and mince the garlic; smash with the side of your knife until it resembles a paste. Peel and thinly slice the onion. Pick the parsley leaves off the stems; discard the stems and finely chop the leaves. Finely chop the almonds. Roughly chop the capers. Add the farro to the pot of boiling water. Cook 15 to 17 minutes, or until tender. Turn off the heat. Drain thoroughly and return to the pot. While the farro cooks, pat the salmon fillets dry with paper towels; season with salt and pepper on both sides. Place the fennel stems and bulb, onion and olives on a sheet pan. Drizzle with olive oil and season with salt and pepper; toss to coat. Arrange in a single, even layer; place the seasoned salmon fillets on top. Roast 16 to 18 minutes, or until the vegetables are tender and the salmon is cooked to your desired degree of doneness. While the salmon, onion, fennel and olives roast, in a small bowl, combine the garlic paste, parsley, almonds and capers. Stir in enough olive oil to create a rough paste. Season with salt and pepper to taste and set aside. Add the orange and orange zest to the pot of cooked farro. Stir in a drizzle of olive oil; season with salt and pepper to taste. Divide the dressed farro and roasted onion, fennel and olives between 2 plates. Top each with a roasted salmon fillet and the salsa verde. Garnish with the fennel fronds and fennel pollen. Enjoy! Looks good, right? It was! 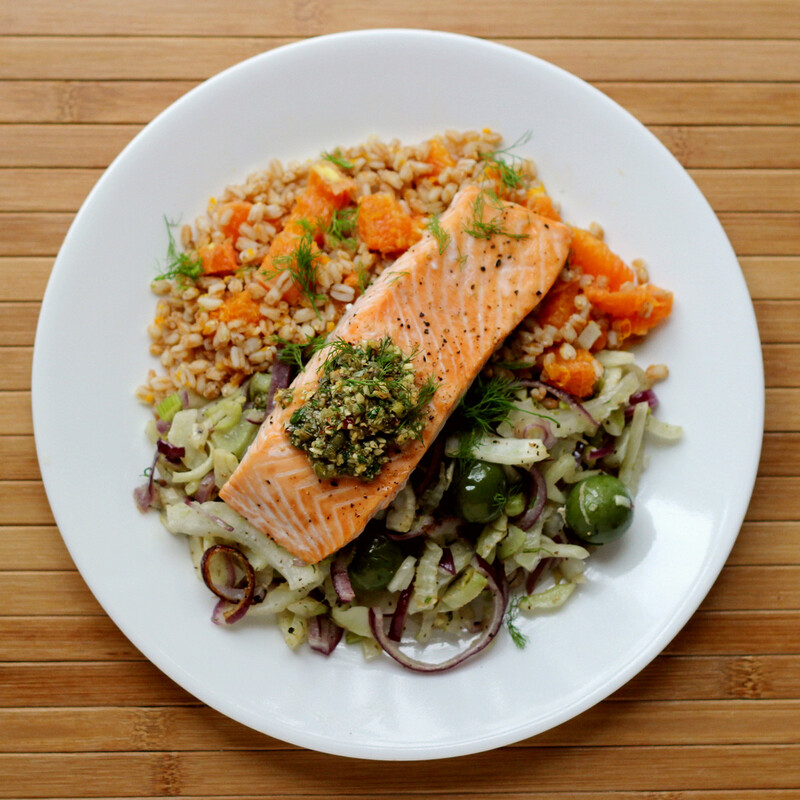 The photo on the recipe card showed the farro on the bottom, fennel on top, and the salmon on top of that. I decided to plate the fennel and onions on one side of the plate, the farro on the other side of the plate, and the fennel on top. It's all pretty clear, right? It sounds simple to do, right? So why not just download the recipes and make them? Here's the deal. Not only don't you need to shop for the normal ingredients, like the salmon and the onion and the parsley, but you also don't need to go hunting for the ingredients that your store might not have. I'm pretty sure I could find oranges any time of the year, but I don't know if I could find Cara Cara oranges. Farro isn't the easiest thing to find, either. Some specialty stores have it, and you can buy it online. But could you find it tomorrow? Maybe not. Same with fennel pollen. It's not a spice you'd be likely to find at the grocery store. Olives are easy, but do you think you'd find Castelvetrano olives? All those ingredients help to make these recipes a little more special. If you like them, you can hunt them down later. If you're not crazy about them - well, you only have enough for one meal, so you're not stuck with extras that you don't have any use for. All of the ingredients for the salmon meal. And then, if you don't cook all that often, you might not want to buy a whole jar of capers or a bag of almonds. Parsley always comes in a pretty big bunch, but this recipe didn't need nearly that much. All three of the recipes I tried had at least a few of those specialty ingredients, including the burgers that were made from ground short rib meat, and the cheese sauce that included hops flowers. When was the last time you saw hops flowers at your grocery store? How much skill does it take to make these recipes? My husband, who never cooks, volunteered to make one of the recipes. He tackled the Spicy Thai Chicken Noodle Soup. I hovered nearby to answer questions and make sure things didn't go wrong. I mean, there's fire and sharp knifes and heavy cookware to deal with. Ingredients for Thai Chicken Soup. If I wasn't there, I'm sure he would have figured it out on his own. Seriously, if the ginger wasn't minced completely, it would have been fine. When I asked him what he thought, he said, "I could serve this to a date." Good luck with that, dear. But his point was that you could serve this to someone you're trying to impress, whether it's a date, your boss, or your in-laws. But these are still simple fast and easy enough to serve on a normal night. The salmon dish was the fanciest of the three, while the soup was more casual. The burgers were the most casual of the three, but still a step above a standard burger. The three meals for two that I got would cost $59.94, so that's a tiny bit less than $10 per meal per person. I'm pretty sure you wouldn't get a restaurant meal for $10 per person. There are also two family plan options available. They're both for four people, but the difference is the number of meals per week. Two meals per week for four people is $69.94, while four meals for four people is $139.88 - that's about $8.74 per person. Pretty reasonable, right? And now, I have a deal for you. I received my meals at no cost so I could do a review, but if you're interested in trying the service, here's a discount code for two free meals with your first Blue Apron box. This is good for the first 50 people who claim it, and it's only good for first-time customers.